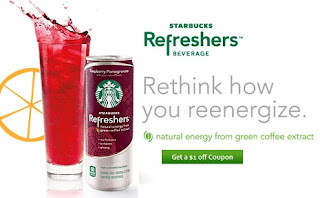 The Frugal Family Life: $1/1 Starbucks Refreshers Coupon = FREE at Walgreens!! $1/1 Starbucks Refreshers Coupon = FREE at Walgreens!! Here’s a coupon you’ll want to print now and hold onto for a Walgreens deal starting Sunday, 5/13, to get FREE Starbucks Refreshers. I haven’t tried these yet, but for FREE I might be willing! Have any of you tried them?